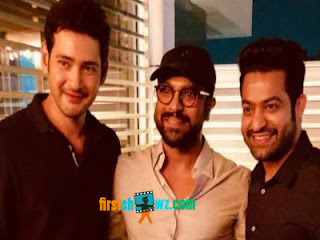 Home / News / Mahesh Babu joins Ram Charan, NTR for RRR? Mahesh Babu joins Ram Charan, NTR for RRR? Rajamouli's forthcoming multi-starrer called with working title RRR is becoming a dream project in Tollywood. While Tollywood fans are all excited to watch NTR and Ram Charan sharing screen in this full-fledged movie, the team has more thrills for us. Mahesh Babu joins Ram Charan, NTR for RRR. No, Mahesh Babu will not be seen in any role or even cameo though we would love to see it, but he'll be giving a voice over for the film. Sources say that the Super Star is happy to lend his voice for Rajamouli's film. Voiceovers are not new to Mahesh Babu as he has earlier did for Pawan Kalyan's Jalsa, NTR's Baadshah and few other movies. DVV Danayya who produced Bharath Ane Nenu is bankrolling RRR as well.